Cool-season perennial grasses established and growing under dryland conditions near Scottsbluff, NE. Photo courtesy of Mitch Stephenson. Planting perennial grasses on marginal dryland cropping areas has long been recommended as a sound conservation practice. Planting perennial grasses for conservation also may provide opportunities to increase livestock production. Expectations for production of perennial grasses should follow the performance for crop production on a piece of land. That is, if an area was low producing for dryland crops, the potential for producing large amounts of perennial grasses is lower than if it were better quality ground with high crop production. Planting perennials is a costly endeavor and comes with a commitment to manage a piece of land as pasture rather than cropland for an extended period of time. As a result, a thorough economic analysis is warranted before tackling this type of project. This includes the cost of seed, planting, and weed management, as well as the potential opportunity costs associated with the reduction in revenue from cropping systems and the potential gain from using the pasture for livestock grazing. Many seed companies have diverse mixtures that can be selected for perennial pastures. It is recommended that you talk with as many of these companies as possible to determine what types of grasses work best in your area. Cool-season introduced grasses are often selected because of ease of establishment, relatively good production early in the growing season, and the ability of these species to take advantage of early spring precipitation. On dryland areas in western Nebraska, selecting species that are tolerant of dry conditions and that thrive in the 14-16” precipitation zones is critical. Some of these species include pubescent wheatgrass, western wheatgrass, intermediate wheatgrass, tall wheatgrass, wildryes, and smooth and meadow brome grasses. Typically, simple mixes of two to four species are the best options for establishment and management. There are many different varieties of these species and local seed dealers can help in the selection process. If you are considering planting cool-season introduced grasses, there is still time to get started for 2018. There are two optimal times to plant cool-season grasses, in the late summer from around August 1 to September 15 or in the spring from March 1 to April 30. Late summer seedings depend on late summer and fall rains and seedings should not take place if the soils are dry or if there are projections of extended drought. Precipitation in the spring is often more reliable in western Nebraska with about 48% of the annual precipitation falling from April 1 to June 30. Spring and early summer precipitation, while difficult to predict, is the most important factor in the establishment of grasses following a spring planting. Climate projections like those found at the Climate Prediction Center can help in making decisions on whether to plant this year or wait until conditions appear more favorable. Current spring and summer precipitation projections suggest that dry conditions may be present over much of western Nebraska in 2018. Summer annual weeds such as Kochia, Marestail, and Yellow foxtail are typically more problematic with spring seedings compared to fall seedings. Planting early in the spring can give the grasses a competitive advantage with the weeds. If weeds become a problem and are overshadowing the emerging grass tillers, they can be mowed at a relatively high clearance to reduce weed heights while still maintaining leaf area on the grasses. Herbicides such as 2,4-D ester at a rate of 1 pt per acre can provide control of broadleaf weeds, but tillers of the seeded species should have at least 5 leaves and be over 6 to 8 inches tall before application of this herbicide. If grasses establish well in the first year, weeds will typically not be as big a problem in following years, but if they are present controlling them will help the grass stand thicken and maintain production. Planting into wheat or other small grain stubble provides a suitable and firm seed bed for perennial grass establishment. Stubble also provides good erosion control while the seedlings are being established. It is important to delay planting for at least 30 days after grain harvest and to control volunteer growth prior to seeding perennial grasses. What about first year management? In the dryer conditions of western Nebraska, cool-season introduced grasses are typically not grazed in the first year, but if there is strong establishment and adequate precipitation to get the growth on the grasses, a very light graze may sometimes be taken late in the growing season. Late summer seedings of perennial grasses should not be grazed before the next growing season. Even if there is good growth in the growing season after either a fall or spring seed pasture, allowing a complete year without grazing will help tillers develop a healthy root system and reduce the risk of overgrazing on the establishing seeded grass stands. In year 2, if establishment is sufficient and production adequate, livestock can be grazed. Ideally, this would take place later in the growing season (mid-June forward). Leaving at least 4 to 6 inches of residual stubble will ensure grasses have the leaf area to maintain photosynthetic growth later in the growing season. A full grazing can usually take place during the 3rd growing season after the planting of cool-season perennials. Allow the grass tillers to reach at least 5 to 6 inches before grazing in the spring and rotate pastures to allow for regrowth on these tillers while there is still adequate soil moisture. Cool-season grasses typically have a bi-modal growth curve with most of the growth occurring in the spring, but if late summer and fall precipitation is available, substantial growth can occur during this time. This fall growth is important for cool-season grasses to store energy and maintain reserves during the winter. Grazing this regrowth very short can harm new tillers and potentially reduce yields the following year. As a result, avoid grazing after the first part of September on establishing grasses to allow the seeded grasses time for recovery before the winter. 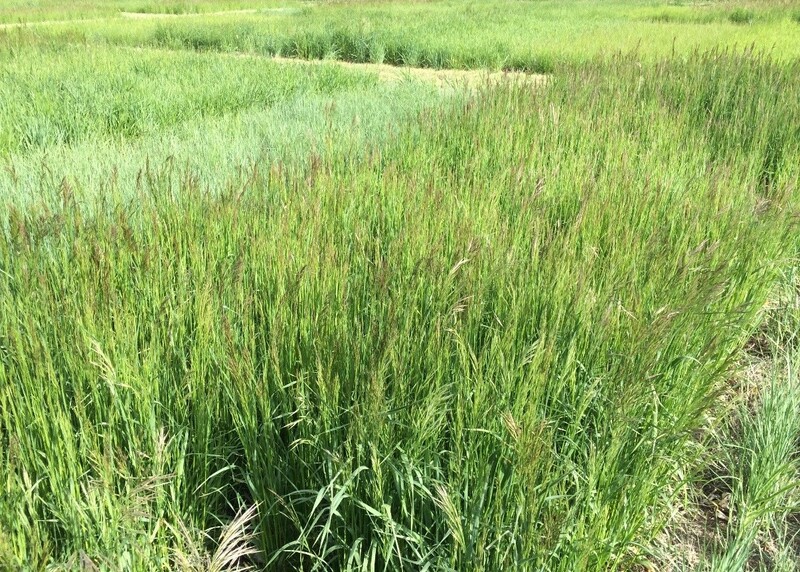 Overall, perennial cool-season grasses are a good option to consider for conservation and livestock use on marginal cropland areas. Under dryland scenarios in western Nebraska, stocking rates of 0.5 to 1.0 AUM/acre are typical estimates for stocking rates with proper management, but monitoring the establishment of the seeding and appropriately estimating the annual forage production will help in setting the right stocking rates long-term. Understanding the production potential of a piece of land also will help in making appropriate estimates for what to expect in terms of production. Monitoring the seeding, managing weeds, and grazing conservatively in the first few years will help the grass establish. For more information, check out the Nebraska Extension NebGuide, Establishing dryland forage grasses. If you are considering planting irrigated perennial grass pastures, this four part webinar series provides great information.